Introduction: Jacob Stone was a French-Canadian and was married to a native woman, Margaret. They lived in the Bald Hills and had three children. One of their sons married Edith Corbett, a long time teacher in the area. When Jacob died in 1897 his probate record included debts he incurred shopping at the Longmire store in Yelm. 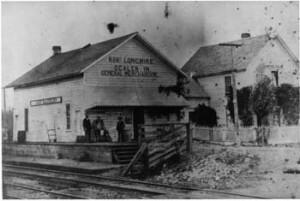 The list provides an glimpse at the products available in Yelm in the late 19th century. 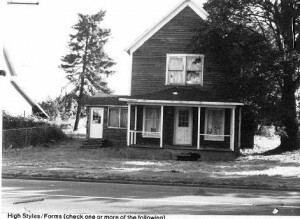 The hotel on the right was later moved west on Yelm Avenue. The following is a list of the types of (though not quantities) of items purchased on Jacob Stone’s account at the Longmire store in Yelm.